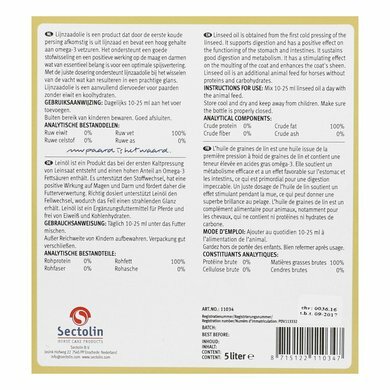 Sectolin Flaxseed Oil is rich in essential fatty acids that contribute to a shiny, healthy coat, gives an energy boost and stimulates digestion. 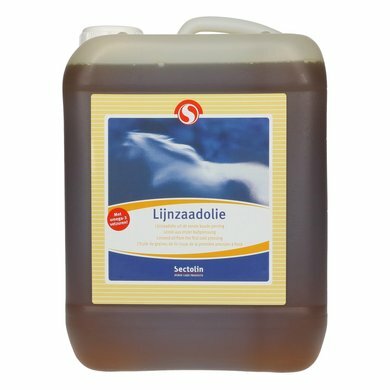 A daily dose through the feed also provides your horse with the natural vitamins A, E and D. The sediment in the bottle proves that Flaxseed Oil is the first cold pressing, and therefore absolute top quality. With Omega 3 fatty acids. From first cold pressing, 100% pure natural. Flaxseed Oil is rich in essential fatty acids and contributes to a shiny and healthy coat, a perfect condition and good digestion. 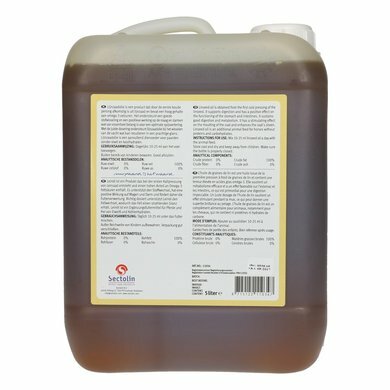 It contains, among other things, the natural vitamins A, E and D. Linseed oil is the first cold pressing this is the best quality you can buy. Settling of this oil only occurs during the first cold pressing and is a quality guarantee. 2 tablespoons daily over the food. Per 100 ml 830 Kcal. Content: 1, 2.5 and 5 liters. 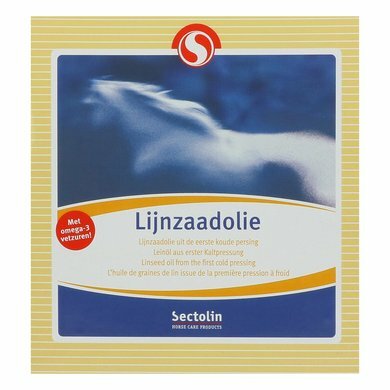 Sectolin brings a complete line of health and care products that support horses on every front in their top condition. Both physically and cosmetically. A horse life long. When it comes to horses, Sectolin simply creates a world of difference. And because difference can be seen, we have put ourselves in a different light. From now on, quality is more recognizable than ever. Our horses eat well for food and their fur shines beautifully. My horses have been working on this product for 15 days now and you can clearly see the difference !! Very tasty too. 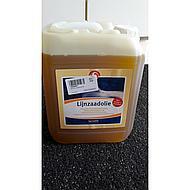 Product is well eaten by both horses and is easy to use. Good price quality! Too bad there is no pump with a 5 liter bottle. Furthermore, excellent product. Good product. Good price. Easy to mix by feed.